The United Union of Roofers, Waterproofers and Allied Workers (UURWAW), based in Washington, D.C., has 22,000 members participating in nine regional district councils across the country. The union represents members who apply all types of roofing and waterproofing systems, including but not limited to: all low-sloped roofing systems (vegetative and solar photovoltaic roofs), structural waterproofing, steep-sloped roofing systems, and air barrier applications. Lifelong learning is an important part of success on the job and the UURWAW offers their members varied opportunities for education and training in such fields as organizing, health and safety and collective bargaining. The union also offers apprenticeship programs for those interested in joining the craft. Their employers and customers know they can count on a high level of skill and craftsmanship from the UURWAW. A knowledgeable worker is an empowered worker, with the skills and know-how to follow the path to success. 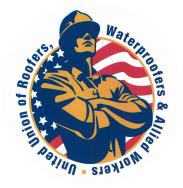 As a member of the United Union of Roofers, Waterproofers and Allied Workers, members gain the strength of the voice of many and enjoy the protection of a contract and dignity on the job. As a union member, you’ll earn higher wages than non-union workers. In addition, members are often eligible for healthcare coverage, either under the national plan or through the local union’s own plan. The majority of our members take part in the National Roofing Industry Pension Fund or a local pension fund, which means you’ll have guaranteed payments for the rest of your life once you retire (after meeting eligibility requirements). Members of the Roofers and Waterproofers Union enjoy the benefits of health and safety programs, training and apprenticeship opportunities and cooperative labor-management research and education efforts. The men and women who make up the UURWAW have a common goal: to work together to provide the highest quality craftsmanship in the industry, and unite to form a voice that calls for a better standard of living for all members.